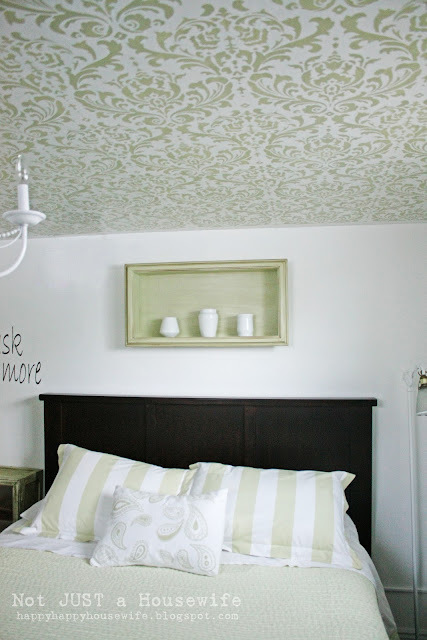 I stenciled a damask pattern on the entire ceiling!!! Why should walls have all the fun??? I wanted to show you a bunch of the after shots first but if you keep going you will see the before and a tutorial on how I did it. I was loosing daylight fast when I took these pictures. I was in a big FAT hurry and I didn’t really pay attention to the setting on my camera or the angle of the shots. I wish they were a tiny bit more clear. My paisley pillow that I hand painted is hard to see. You can get a better look at that HERE. And more bedroom pictures HERE. I also made a chandelier. I just couldn’t put that ugly ceiling fan back up after the ceiling got a gorgeous makeover! I will have a tutorial showing how I made it on Wednesday. Okay, here is the before. I know you all know what a white ceiling looks like, but I needed a before so that the after would be more dramatic :) So here you go. Cutting Edge Stencilssent me a stencil of my choice to review. They also sent me a foam roller. I have stenciled a fair share in the past so I thought I was pretty familiar with stencils. I was pleasantly surprised to see that theirs was extra thick. And the stencil was really large which helps when you are painting a big area. Because I was doing my ceiling and I had gravity working against me, I used a spray adhesive on the back of the stencil along with painters tape. I started in the corner above my door so that if I messed up, no one would really notice when they looked in my room. The 2 things you need to remember are a) don’t overload your roller with paint! b)don’t push too hard. Both of these things will cause the paint to bleed under the stencil. If you are nervous, practice on cardboard or a garage wall. I found that I had to roll in all directions to get paint into the nooks and crannies. The first one I did 2 coats of paint. It was nice and even but I decided I like the look of one coat of paint better. It looked like fabric. I know you are lovin’ the shower cap. I was totally channelling my inner lunch lady. I knew when I saved the free shower cap from my last hotel stay I could use it for something. Not a speck of paint in my hair! The stencils have these points ( shown by arrows). When you go to paint the next row, you line up the stencil to these points and it keeps everything straight. Pretty genius if you ask me. Okay, now for the low down. Was this project easy? Yes. Was this project time consuming? Yes. I have four kids so that equals about 49 million interruptions. Because I was doing this on the ceiling I couldn’t just peel it off then move it in place and immediately start on the next one. I had to wait for the paint to dry on the stencil (5-10 minutes) before I could place it again. Why? Because I had to press on the stencil to get it to stick to the ceiling. Not fun when it is all wet. But it wasn’t too big of a deal. I would stick it up, paint it, take it down, and then go do something else for a bit. Change the laundry to the dryer, unload the dishwasher, play Go Fish with my 3 year old (you get the idea). Then I would run down and do another one. So in total, it took four days. IF I had been doing a wall like a normal person, it would have been MUCH faster. And IF I didn’t have any children at home to interrupt it would have been much, much faster. Overall it was TOTALLY worth it! I have no idea how I lived with a white ceiling before. 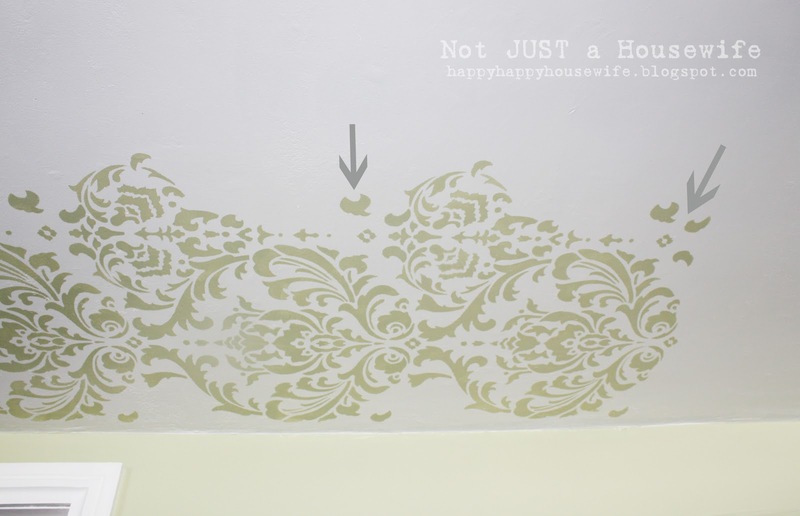 And I have plans to use this same stencil upstairs in my hall. I am thinking cream and chocolate brown. 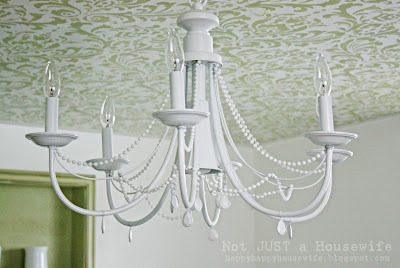 . .
On Wednesday I will show you how I made this chandelier!!! Feel small like a bug! That's AWESOME but OMG did that kill your arms and your neck?? WOW Wonderful Idea!! Can wait to see how you did the chandy!!! No way! I cannot believe you did that! Just looking at those pictures makes my neck ache! It's absolutely gorgeous! Your room is just beautiful! This is AMAZING! What a great job….very cool!! that is time commsuming but looks fantastic..great job! That is truly beautiful! I'm so impressed. Your bedroom is beautiful. Wow, amazing!! My arms and neck ache just looking at it. A wonderful turnout for such a tedious job. I admire your grit and determination. I know how time consuming, and painful home renos can be and this is a testament to your strong character. Your neck must have been sore. This is so gorgeous I'm almost speechless! I wish I could try, but alas the icky extreme popcorn ceiling strikes again. lOVE IT!! Great blog! I'll be linking up some of my stuff tomorrow…. It looks SO awesome…but I would be dead if I tried that…HOW in the world did your neck hold up? Stupid stucco ceilings! I would love love love to do this in our bedroom, seeing as the theme is damask, but that dang stucco gets in the way. WOW! It looks amazing! I remember I started sponge painting a ceiling one time I thought my arm was gonna fall off so I only got a quarter of the way done and left it. My Hubby was so annoyed when a year later he had to paint it white again when the house sold. You did a fantastic job! Great photos too. Wow what a great job you did.It looks great. I really like your blog. OMGosh, that is soooooo beautiful~ I LOVE IT!!! WOW!! I adore the stencil pattern! This is amazing!! So nice! I just discovered your blog and it is fantastic and have become a new follower. I'm hosting a $50 CSN gift certificate giveaway for those in the US and Canada so drop on by! I love it. I never thought of making my ceiling fun! What a great way to wake up in the morning! Absolutely stunning! The pattern just draws the eye up. You make it look so easy! This took my breath away! I even made my husband stop to look at it. So romantic! wow, looks so great! I always get paint in my hair when I'm painting even walls, lol! Doug looked at this and all he could way was "that is amazing". I love it too. You seriously never cease to amaze me. Way to go! What the….you did WHAT???? Oh my gosh! Is there a Love button? I would push it 10,000 times! This is so amazing. I love that it's on the ceiling. I love your subtle color choices, and how together, with the pattern….it makes a bold statement. You are seriously getting some huge KUDOS from me! Way to go!!!! I love love love it!!! The color and pattern are perfect. Your bedroom is like a dream! WOW!! I love this! You did AMAZING!!!! I am so impressed. What an inspiration….. So incredible! That is stunning! whoa! I love this. What a great idea. I'm thinking this is worth copying… you're flattered right? Ok so I own a faux finishing company and we have never, ever stenciled an entire ceiling! I hope you had a massage after!!!! hahaha! Wonderful job! I would just lay in my bed and look at it all the time! This turned out just awesome! 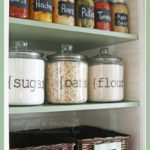 I have rough ceilings so no go there but I do plan to do something similar on the wall behind our bed and in my closet! 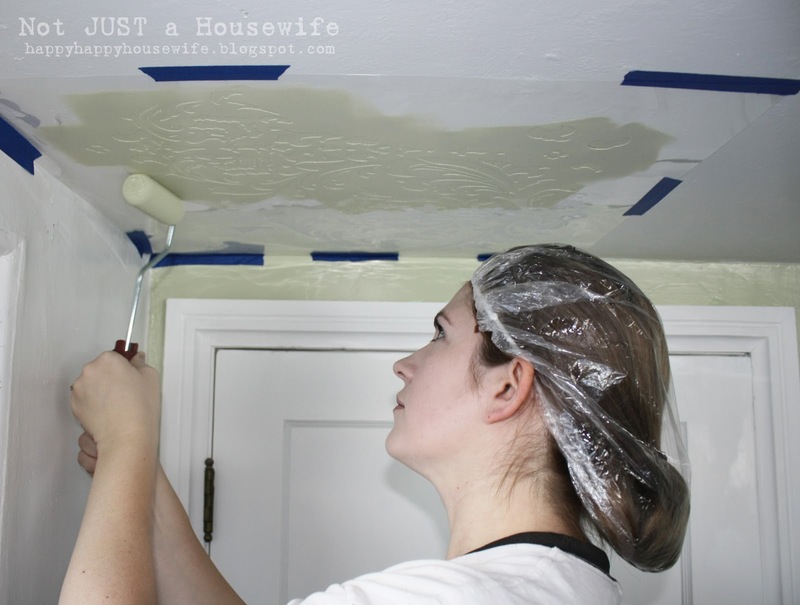 Love the idea of a shower cap when painting the ceiling. I have had paint in my hair for months sometimes after splatters and oops bumps!!! This looks absolutely amazing. I stenciled one wall of my daughter's room so I totally get how time consuming the project is. I can't imagine doing a ceiling. Your neck must have been hurting you after this. I linked over from Domestically Speaking. 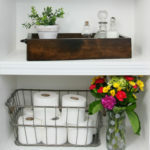 If you have a chance I'd love if you would check out my blog at http://www.diybydesign.blogspot.com. Thanks. Amazing!! Love it. You know you wake up every morning an even a happier housewife looking at that each morning. Great job! Love it, Stacy! It's beautiful!…both the ceiling AND the chandelier. I'm so impressed with every project that you do. You are amazing. Love your ceiling and your bedroom. Great calming and simple effect with such class and style!!! LOVE it! I'm your newest follower. Stacy, that's gorgeous! I can't imagine how much your arms and shoulders were aching why the time you were done though, but well worth it! that looks amazing! great idea, and what a nicer thing to look at than a boring ol' ceiling! WOW!!! That is all I can say!!! 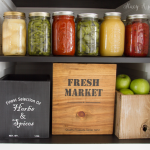 Visiting from Shabby Nest link party…Great job! Beautiful! Gorgeous! Stunning! I don't know that I have enough adjectives to describe your ceiling. It has to be the most satisfying thing to open up your eyes in the morning and see that gorgeous stenciled ceiling first thing. I hope you spent an hour at the spa getting your neck rubbed after. Thanks for sharing this. This is very pretty and unusual. Nice work! That is so pretty. I love the color you chose. The shower cap is genius! I've done a few ceilings, but I can't imagine stencilling! Fabulous. Lots of work, but what a beautiful result! That is stunningly gorgeous! Enjoy your beautiful ceiling! Your ceiling looks fantastic! I love the idea. Enjoy! love it! very creative, I am impressed. Very impressive! It looks wonderful! Okay, that is totally amazing!! I need to develop a little more patience before tackling a job like this but it sure looks fantastic! I LOVE that!! Oh wow, it is STUNNING! You win! Every award there is to win! I would not have even tried the ceiling, mostly because my arms would get tired and I am wuss! Thanks for the stenciling tips-I too get to use some of clear choice stencils-I am chomping at the bit for the package to arrive! Any other tips that you want to share with me would be awesome! I showed ur amazing stencil skills to my husband, he just said NO and handed the computer back to me!! Have a fabulous weekend!! Thanks for the inspiration! Oh my goodness! BEAUTIFUL! I also just made a chandelier…well, it's a fake one…but it looks cute! I love the color of paint you used too! what a great idea! i love it!! :) where did you come up with the idea?? Holy cow, that's gorgeous! You and your inner lunch lady did a heck of a job! Well done! Wow this looks amazing and looks perfect with the rest of the room! Great job. I need one of those shower caps! I'm always getting paint in my hair, and it is so, so hard to get it out! This looks fantastic. I would never have thought of stencilling a ceiling but it looks great. Love the colour too. That is crazy awesome! Great job! I love painted ceilings! Amazing! It looks great! Is your neck killing you?! So worth the work! Holy moly, I am loving this!! Thanks for sharing your great idea and tips. Now this is truly a labor of love of stencils. My daughter and I painted a ceiling before, it was hard work just with plain old white paint, can't even imagine stenciling. Yeah and we ruined our caps that we wore, wish I would of thought of that stylin shower cap. A M A Z I N G !!! This just ROCKS the universe!!!! i live in an older mobile home and the bedroom ceiling is less than lovely! Wow, Stacy – I never ever would have thought to stencil the ceiling but it looks so pretty! You did a fantastic job (and survived! lol) I love how it looks in your pretty room! 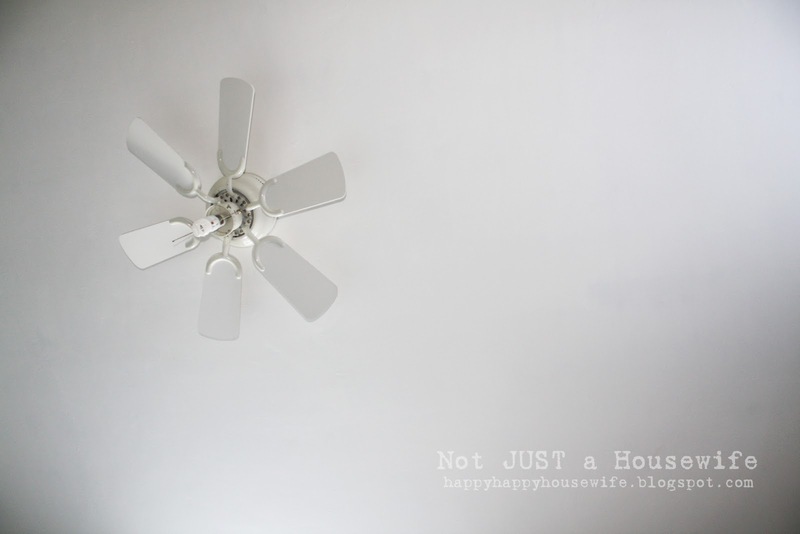 What a wonderful idea – be gone plain ceilings! So, is your ceiling textured at all? I want something fun on my celing but I don't know how I'd go about doing it on a textured ceiling?! Yours looks great! Love the idea!!! 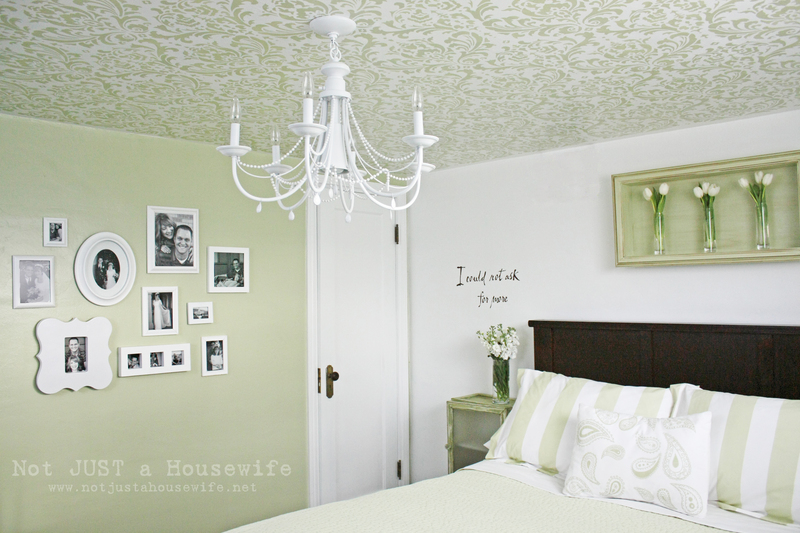 Ohhh my gosh…your stenciled ceiling is just the most awesome thing that I've ever seen! 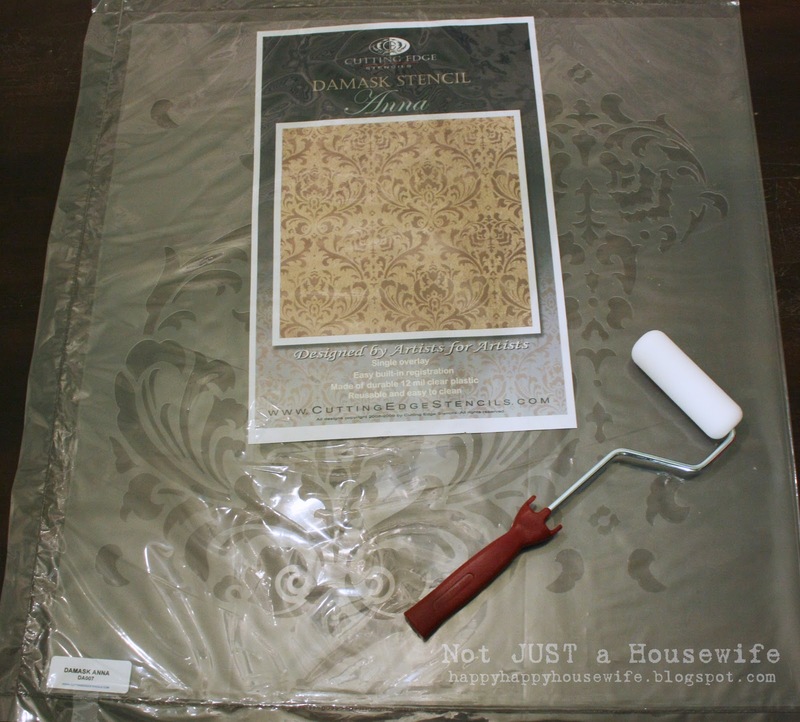 Of course, a beautiful damask is one of my all time favorite patterns and I love the pretty olive green color…also one of my favorites! Thank you so much for sharing your beautiful home and the great tutorial with us…this was such a treat! I ADORE the way your ceiling turned out! It's FABULOUS! 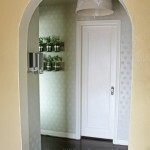 I chose the Anna stencil too and I LOVE it but only used it in a small hallway nook. I'm dying to use it somewhere else. So pretty. This ceiling treatment is like no other I've seen! Truly amazing! A truly awesome ceiling, and it makes such a great statement in the room! Wow!! That's stunning! I love the chandelier too! Great job. 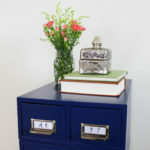 Gorgeous – add such an interesting detail to your house! Love it and thanks for being honest about how easy it is to do with kids underfoot…..easy but time consuming is okay with me! This is completely amazing! Love it! It looks awesome! well done! How is your neck?? I have stenciled a bedroom (walls!) with a large stencil, it is still very time consuming but the end results are cool. HOTEL SHOWER CAPS!!!!! A friend of mine uses them to cover plates of food (cookies) etc. Isn't that a great idea? and they are washable and reusable too! I LOVE this ceiling!!!!! Do any of you crafty ladies happen to know if you can scrape a popcorn ceiling and get a smooth enough finish to do this? I would actually be willing to go the the work for this. Check out our TOP 10 Post and b e sure to check out EXCITING CHANGES at THE DIY CLUB post as well–REALLY EXCITING!! How on earth……….that turned out so nice! How do have the patience?? There is no way I could that! Will you come do my bedroom?? Pleeeeaaase!! This might be one of my favorite projects of the year and it is still January! So beautiful. Congrats on making it to the DIY Club top 10! That is totally amazing and I love the damask design. One question? Does your neck hurt? Thanks so much for sharing your amazing ceiling on Passion for Paint! I hope you’ll drop by this weekend or join the party again soon. VERY cool! This really pulls the room together. Looks awesome! Such a cool idea! I totally admire you for doing this 1. because it is on a ceiling and after while I would think your neck would hurt and 2. because you are a mom of four kids! Go you! holy mind blowing!! You have patience of STEEL! Hats off to you my dear, you really are amazing. Great job! SWOON! This is something you would see in a high end design catalog… or better. LOVE IT! If we weren't renting right now I would buy a stencil and get to work asap. Great job. Would it have been easier/faster if you had a few stencils to work with? Or is it too hard to line up the arrows like that? Complete awesomeness! I am totally impressed. I don't know if I would have been as brave as you; but, I think I would like to try in a smaller area. I love this! I am going to feature it on CrazyDomestic.com this Friday! Thanks for linking up! Your site is darling! Stacy, I am in Love!! What a gorgeous ceiling. Wow!! !I would have never thought to do this… great job! Stacy, Absolutely beautiful! I love the damask pattern and it's so nice to see the beautiful color and pattern and an unexpeted place! Great job! That is beautiful! Guess I'll have to scrape the popcorn off the ceiling and try it! That's gorgeous!! I'm a new follower! This is so pretty!!!! What color paint did you use? Another question, because I reallly want to do this, How much texture does your ceiling have? Is it perfectly smooth? Mine's not a popcorn ceiling, but it does have a blown texture to it. Wow…that is impressive! Great job. And I love the size of the stencil…thanks for the resource. Great, very beautiful. Now I'm your follower. Kisses. What an absolutely fabulous idea! I love the paint color as well! I would love to do this to my ceiling but first I would have to scrap off all the popcorn…messy. Hey, if you are interested I also have a blog…check it out! I am DIYing (haha) to stencil something… either a wall or furniture or curtains or… I guess now…. a ceiling!!! Love it. Love it. Love it!!! Thanks for sharing! Seriously, seriously, seriously amazing… Great job!!!!!!!! Wow that is amazing! Did you have a neck cramp after? I dislike painting ceilings so I have a lot of respect for ya being able to do that. That's just AWESOME!!! You have some heavy duty patience to tackle that one. I just love it. I wish I had just a teeny bit of your drive! And you did it with four children under foot! I'll just call you Mrs. Michelangelo:) GORGEOUS! I love this – just not sure I have the patience for it. 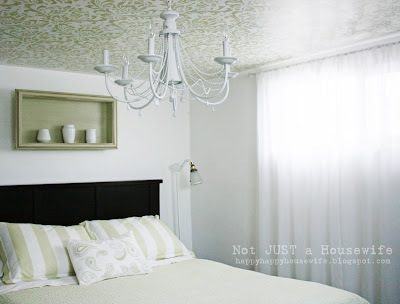 I just had to link this to my ceilings project post – totally beautiful, you did an amazing job!!! LOVE IT!!!! Your poor neck and arms………..but well worth it!! holy guacamole! that is beautiful!!! well done. absolutely BRILLIANT. thank you for sharing!! I don’t normally post on blogs, but I have to say thanks for sharing and awesome job. The ceiling with that chandelier looks simply beautiful. Great job! I absolutely LOVE this ceiling! I want to do it so bad, but I have the dreaded popcorn ceilings. Really looks fabulous! Love this look ~ too fabulous for words! I too would like to know what color you used and also what type of paint, flat, satin, etc? What color of paint is your green? This looks lovely! This is perfect for my ceilings with those infamous cracks! Loved the idea in BHG magazine. So many comments on your ceiling! It is BEAUTIFUL! 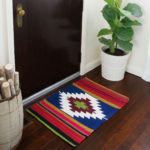 I just saw it on the last page of the August, 2011, Better Homes and Gardens. I had never been to your blog, and I love it. I have stenciled ALOT, but never a ceiling. I, too, had children all over when I did most of my stenciling. Definitly worth it, and I am going to think about doing this, too. I just wanted to thank you for your post, and thank you for the spread in Better Homes & Gardens. 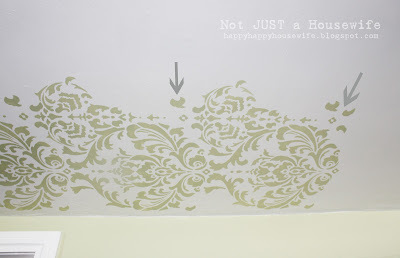 Due to that article, I did the same stencil in my hallway, and have received rave reviews! You gave me the confidence to try something new, and I was so proud of the results. I have a nice chic feminine touch to my hallway that even my husband enjoyed! I have told countless people about your site now. Thanks again for an easy “summer project.” I really should have called it “weekly project” because it was so easy!!! I am so in love with ALL of the projects that you post!!! You’re awesome. 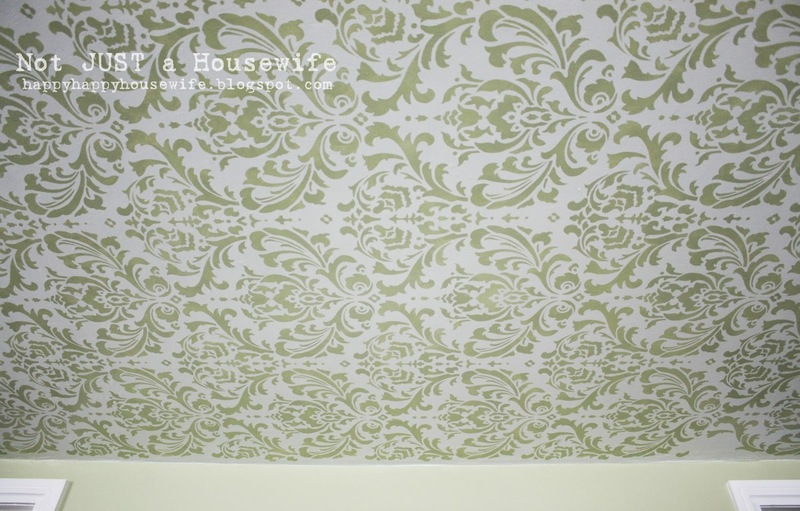 Hi Stacy I’m the visitor from Perth, Western Australia who just viewed your stencilled ceiling! It looks great! 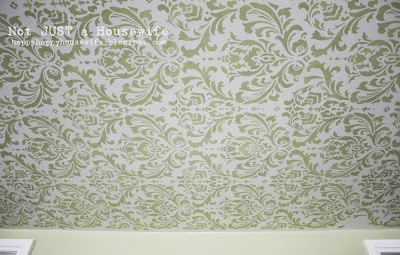 Have you ever wallpapered a ceiling? Not as time consuming but has its own challenges.Am inspired to try what you’ve done! This is gorgeous! Where did you find your great stencil? Oh sorry, I see the part that says where you got it now! Love what you’ve done on the ceiling! Amazing! Hard job right? I’m a new blogger and I just found your blog. I also joined in at Tuesday’s link party. I’d like to feature your post in my blog since I found it really interesting with a link back to you ofcourse! Is it ok with you? I’d love to hear from you soon! Oh my lordy, how on earth do you not have neck pain? I did just ONE wall, took my about 7 hours, and I felt like dying after. You are the stencil queen in my book!!! Your ceiling is stunning! That ceiling is beyond gorgeous! What a lovely site it must be to wake up to. I HAVE to do mine too! 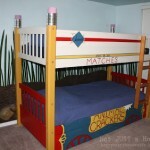 Did you make the shadow box that hangs above the bed? I would love to know how you made it or where you got it. Thanks- this is the number one project on my to-do list. Wow!! I just finished stenciling my wall and that was hard enough I can’t image the ceiling! It looks amazing though, so I bet it was worth the hard work. I would love for you to share this at my link party! Thank you do much for the inspiration, great directions, really nice photos (true) I can’t wait to check-out the website and get started. Perfect for my cottage house. I love you! Believe it or not your blog was just read in Pakistan. I’m working here at present but I just woke up to the idea today of doing exactly this kind of ceiling work to my apartment in Chicago when I get back this summer and a google search later I found this fantastic post. I did a bunch of ceiling work in college in my fraternity and am looking forward to this project already. Your ceiling looks gorgeous, like a serious professional job. Absolutely LOVE this. And your blog. And your projects. And your sense of style. Oh, and the shower cap. :) Featured this on my blog this morning. Thanks for the inspiration! I stenciled my ceiling in this pattern as well in grey. 2 weekends and 10 weeknights later and it’s all worth it! I voted for you on Shaw Floors. Saw your picture of your bedroom and thought it was just beautiful. I haven’t read your post yet of how you did it but I’m sure it was hard work. Hi. I have three individual trays in my living room in which I will be doing this, if I ever get around to it. I’ve had the stencil for almost a year already! Anyway, unfortunately I have textured walls. Is your ceiling textured? I’m thinking that’s definitely going to provide some challenges. Sorry, I suppose I should clarify. I meant tray ceiling, not tray as in serving tray, lol! Shopping for cars is generally a stressful experience. and determination, your car shopping experience can be devoid of stress. 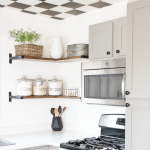 I think the idea of a pained ceiling is beautiful… one question- what spray adhesive did you use? I am actually thinking of doing this in our dining room and want to make sure we follow your instructions exactly. I feel like I am commenting way too often, but I have to. You are a goddess no joke. I do not know how you do it all and still come up with fresh ideas even though this one is two years old. You always come up with the freshest ideas. I don’t know how you dream up all the cool ideas you have. You just keep getting better and better like a fine wine. Please continue to inspire us, don’t even think about retiring any time soon. Bless you and yours and keep growing and blessing us with the fall out of your blessings. Thank you for all you do. Looks amazing! How did you handle the edges of the room, where you only need half of the template?